The StoryWood 4R-3 O-Type is StoryWood’s take on the ergonomic offset body style. The standard model uses a 25.5” scale length (24.75” optional) and is available in either hardtail or trem configuration. Our offset is not limited to typical offset pickup configurations, so go with the set that meets your needs. In the guitar above, we used 3 P90s wired to a 5-way blade switch. In positions 2 and 4, it sounds like the world's fattest strat! All pickups are body-mounted and our design eliminates the need for a pickguard. Neck radius - While 12" is standard, we also offer a vintage 7.25" radius, modern 9.5" radius, or a 10 to 16" compound radius. Book-matched figured-wood top – We have access to a variety of reclaimed and salvaged species of tonewoods that make incredible book-matched tops, including redwood, mahogany, walnut, pistachio, and port orford cedar. Typically, on contoured bodies, we will do them as a “bent top,” which allows the top to follow the curve of the forearm cutaway. Depending on the specific wood set, we will at times try to eliminate a possible point of stress by gluing the top flat to the core body, and the arm contour works through the joining point, exposing the core wood to the front. Semi-Hollow body – The offset body style lends itself nicely to a thinline configuration and is done in conjunction with the book-matched top option. This style becomes a full flat-top and can be executed with or without an “f-hole” in the upper bout. Figured fingerboard – Options here include flamed, curly or birdseye maple and a variety of figured dark tropical woods. 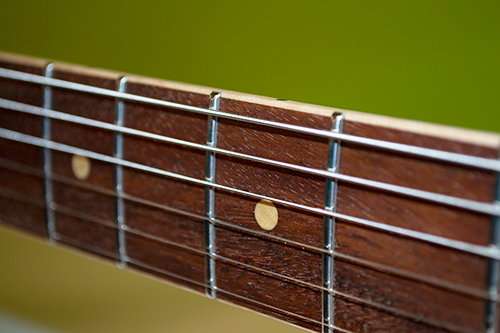 Bound fingerboard – Fingerboards can be bound with a choice of traditional binding or contrasting reclaimed wood. Graphtech Ghost piezo system – The piezo option can be configured with either the hardtail or trem using Graphtech piezo saddles and the Ghost pre-amp system. 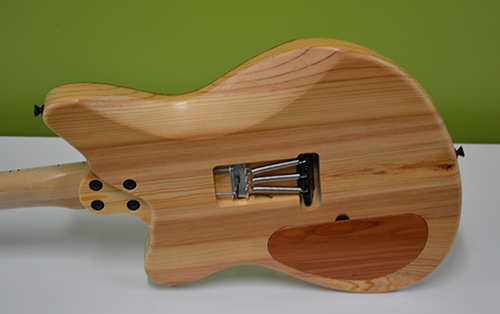 StoryWood guitars are designed with magnetic control cavity covers, using tiny neodymium magnets, instead of screws. 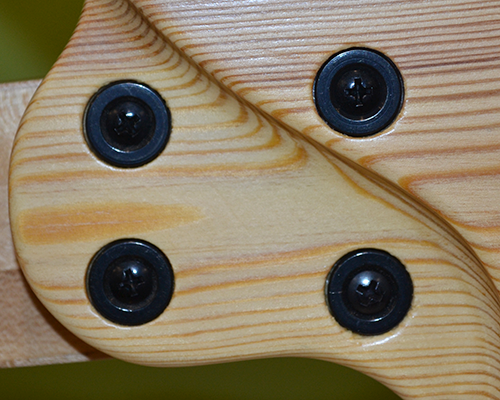 Standard cavity covers will match the body wood. Standard configuration for trem guitars is an open trem cavity - however, we're happy to provide a trem cavity cover upon request. Your guitar comes with our special neck heel that provides much easier access to high frets by getting some wood out of your way. For a visual step up, consider a bound fingerboard. This can be done in traditional binding or using contrasting reclaimed wood. Pictured here, this neck is a mixture of water-recovered Panamanian Rock Walnut for the fingerboard, reclaimed factory maple for the core neck, and figured factory maple binding.